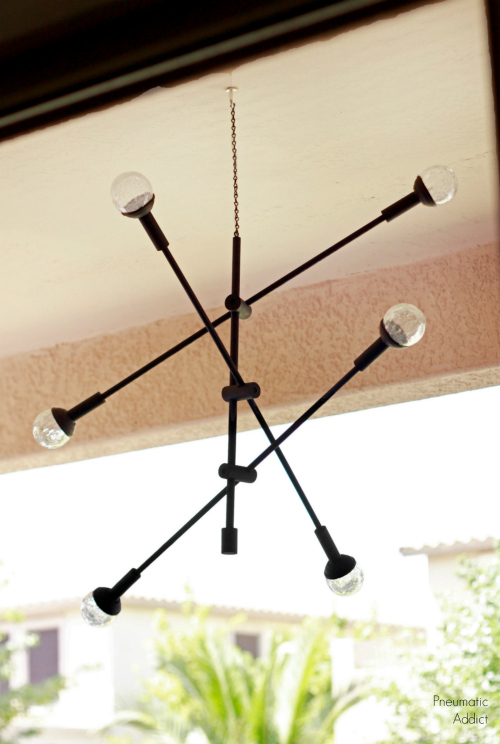 I've been in love with the Mobile Chandelier from West Elm for a long while. I've been scheming of a way to make my own for months. I was walking through the garden center of Walmart last week and I discovered these. 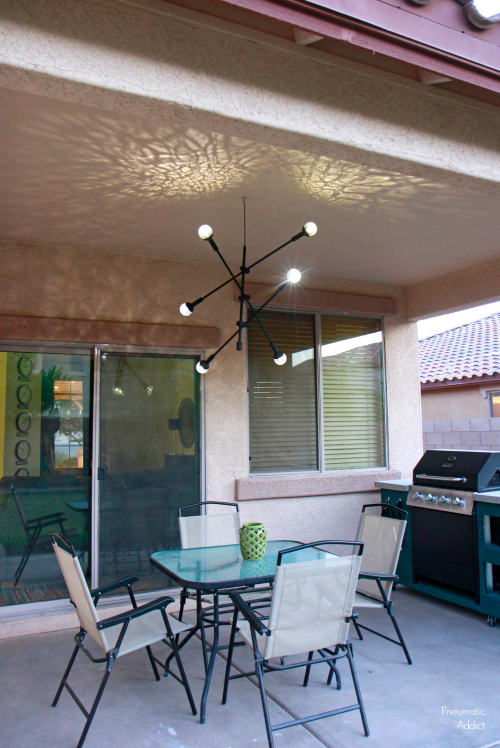 So, if my idea worked, not only would I have my West Elm knock off, but I could hang a chandelier over my patio without having to run new electrical. Good news. It totally worked! 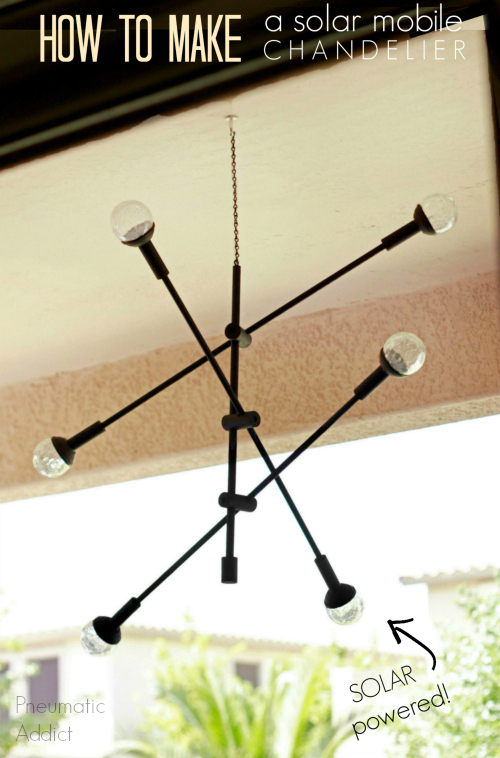 I love it and if you scroll down, you can learn how to make your own solar powered mobile chandelier. 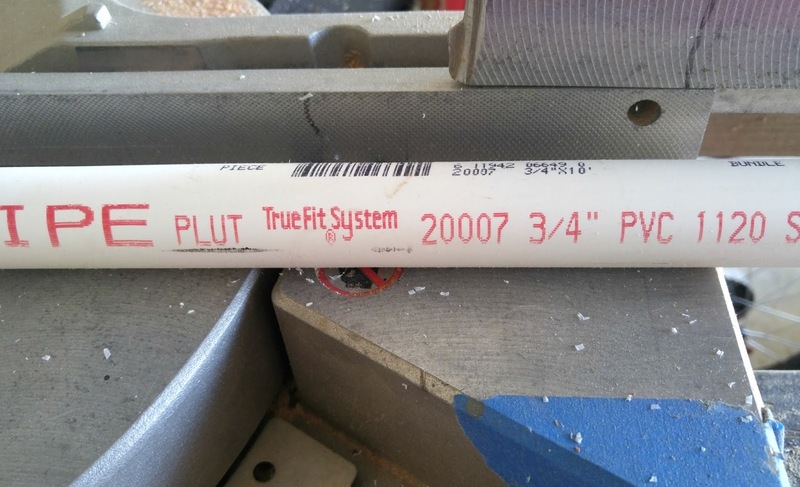 (3) 1/2" wood dowel @ 28"
(1) 5/8" wood dowel @ 28"
(6) 7/8" wood dowel @ 3/4"
(4) 1-3/8" wood dowel @ 3"
(6) PVC pipe @ 3-1/2"
1. The first step is to cut your wood dowels and PVC. 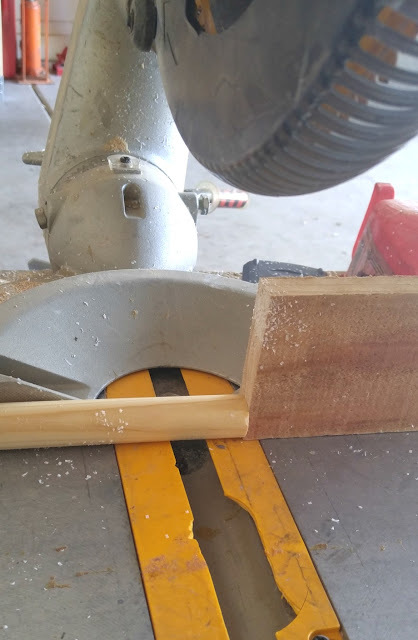 Making repeated cuts goes a lot faster if you clamp a stop block on the fence of your miter saw. 2. Drill the arm connectors. Place the 1-3/8" pieces of dowel in a clamp and drill a 5/8" hole, vertically, 3/4" from the edge. Turn the dowel about 1/8 turn and drill a 1/2" hole vertically, 5/8" from the opposite edge. 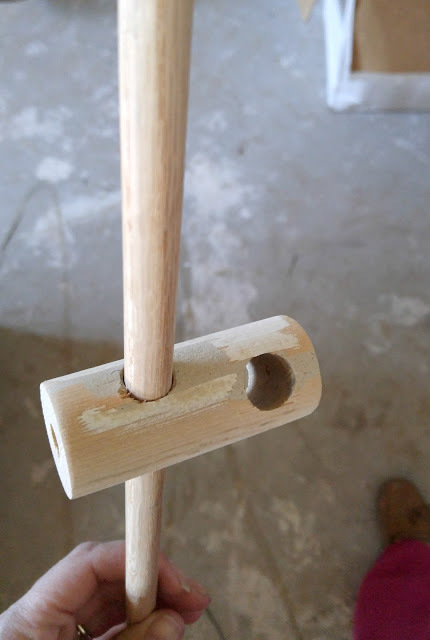 If you want your arms at a less severe angle (which I wish I had), maybe turn the dowel a bit more than a 1/8 turn. 90 degrees would make the arms completely horizontal. 3. 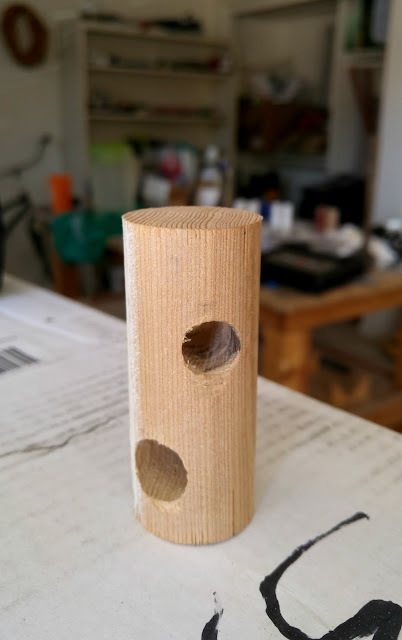 Slide a dowel through the 1/2" hole on each connector. Center the connector and pre-drill a hole though the end and into the dowel. Drive a 1" screw to secure it in place. 4. Slide the connectors onto the 5/8" and space evenly apart. Pre-drill a hole on the end of each connector and secure in place with a 1" wood screw. 5. Sorry for the lack of photos for the next step. 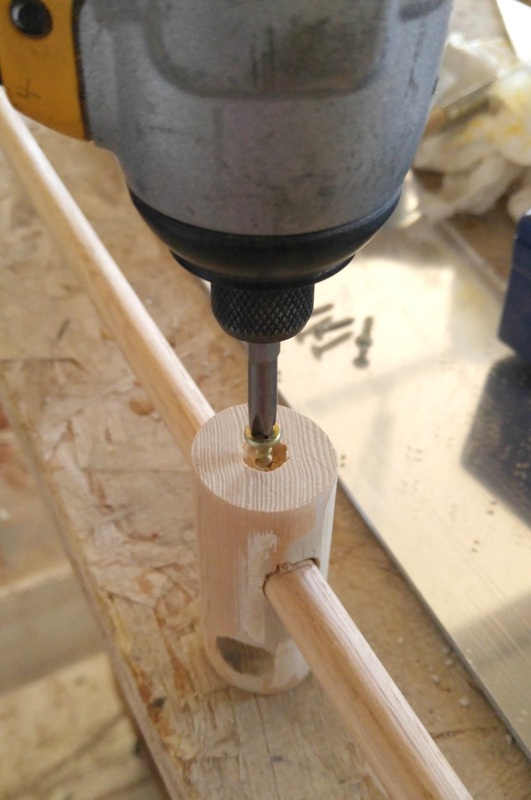 With the remaining 1-3/8" x dowel, drill a 5/8" hole, 1/2" deep. Apply glue and insert the 5/8" center rod. In the center of the other end of the center rod., attach the eyelet screw. 6. 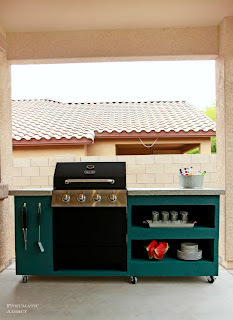 I was only able to find this type of PVC at Home Depot. It's thinner than the typical pipe and has a matte finish on the outside. It cuts easily on a miter saw. 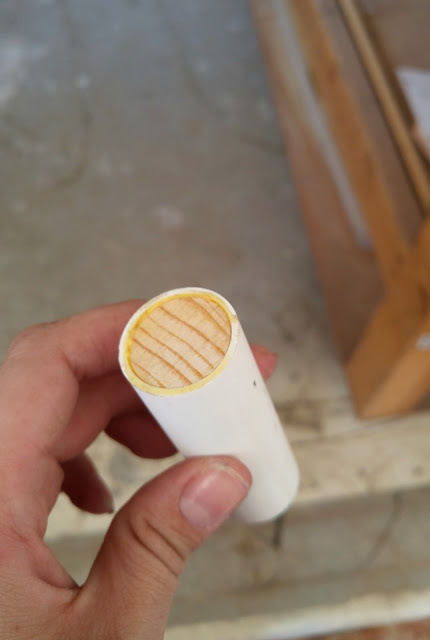 To make the sockets which will hold the lights, insert and glue the 7/8" dowel pieces into one end of the pipe piece. Let the glue dry completely. 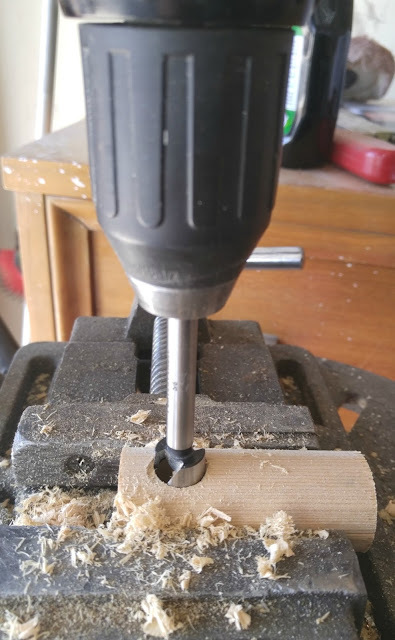 In the center of the wood, drill a 1/2" hole, 1/2" deep. Slide a socket onto each end of the arms and secure with glue. At this point, the frame structure is done. Time to paint! 7. I painted the base of my lights, but that's optional. 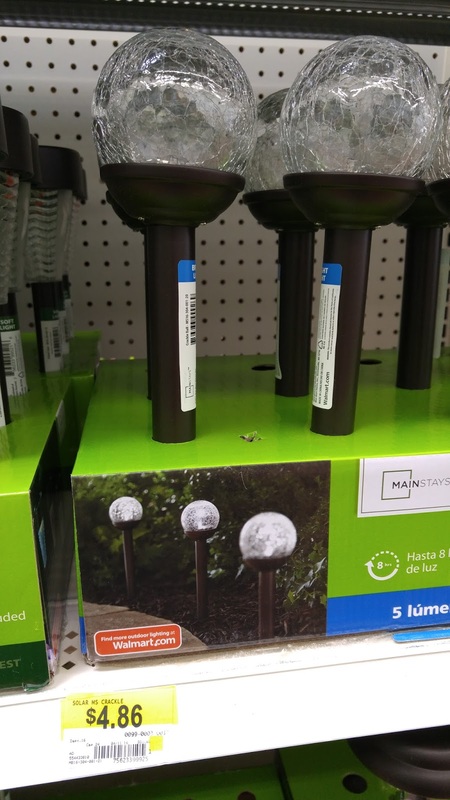 The base stem of the Walmart lights fits pretty snugly into the PVC pipe by itself, but to give a little extra security, wrap the stems with a few layers of teflon thread tape. 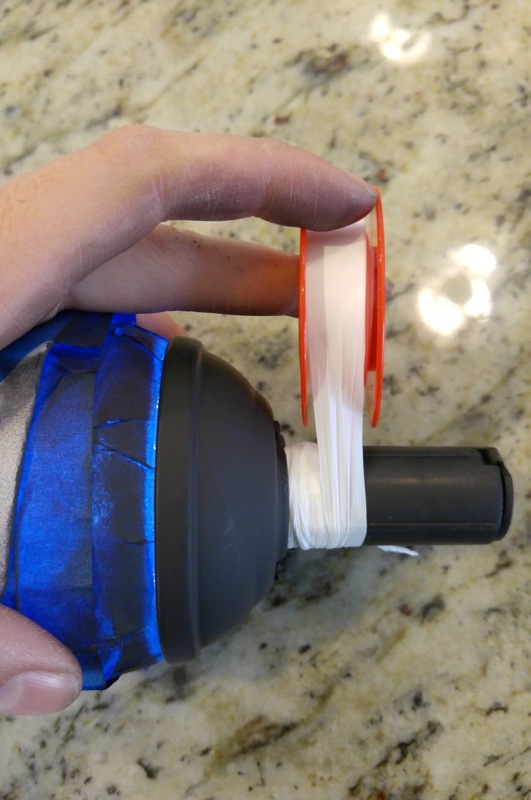 If you twist and bunch the tape while you wrap, it will give the surface more texture and grip better. Why not just use glue? You want the lights to be removable when its time to replace the battery. All that's left is to insert a light into each socket, attach the chain, and hang up your masterpiece. The lights are photo sensitive, so the show doesn't start till sunset. In this shot, you can catch a glimpse of my rolling outdoor island. The lights hold about an 8 hour charge. When the batteries eventually do go dead, simply pull the light out of the socket and replace the battery with a new, chargeable AA. The cracked glass of the globes makes such a pretty design on the ceiling. 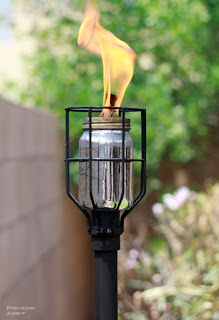 For some more outdoor DIY ideas, check out how to make an Industrial Style Tiki Torch, and my Rolling Outdoor Island Building Plans. What do you think? 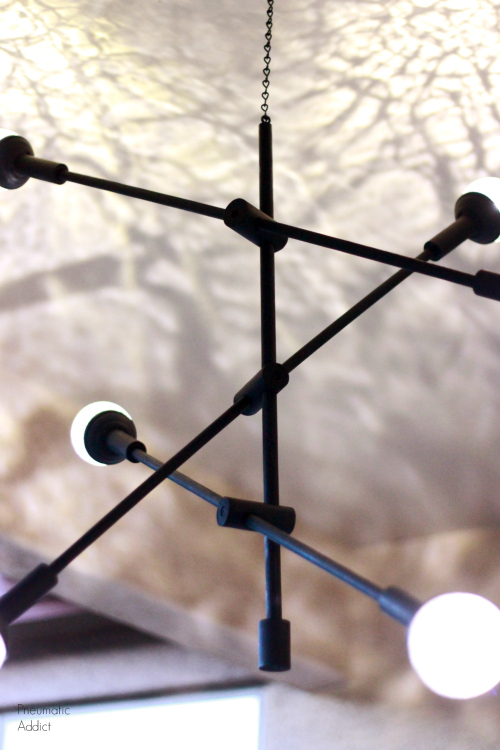 Are you ready to make your own solar powered mobile chandelier? Pin the image below to save the idea for later. How lovely and unique it is! Its completely new to me, I would definitely try to create same sort of piece, lets see whether I'm able to make it or not. However it has been described so thoroughly that I hope that I would definitely be able to create it. Being an electrician in bel air, and delivering such kind of service to various industries has made me proficient in this field but still thanks for sharing such good stuff here and giving me opportunity to say something here!